Put the lobster bisque into a pan. Fill the tin with water twice and add to the bisque. Put over a medium-low heat and heat through, but do not boil. Keep warm on a low heat. Meanwhile, heat the oil from the anchovies in a wide pan over a medium heat. Add the onion and gently fry until soft, but not brown. Add the carrots, then the anchovies, then the rice, and stir well. 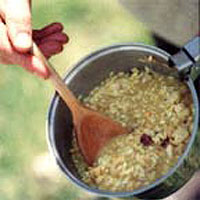 Add two ladlefuls of the hot bisque to the rice and cook, stirring regularly, over a low heat until the liquid is absorbed. Continue like this until the rice is nearly cooked - about 20 minutes - then add all the drained seafood and stir through. Add the last of the hot bisque, and stir until absorbed. You shouldn't need any more salt, but season with freshly ground pepper. Serve.